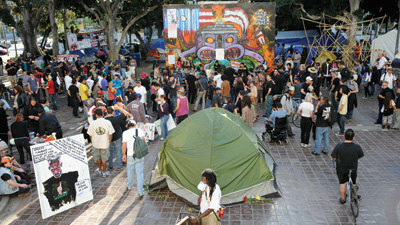 1,400 Police officers arrested 200 people last night as the US´s largest reamining Occupy camp is dismanteled. Some outlets are reporting the use of excessive force by LAPD. The BBC reports that last night at 12:30 am 1400 Police officers moved to Los Angeles City Hall to shut down the Occupy LA movement. The move comes 48 hours after the city served the emcapment with an eviction notice. By Sunday night many of the tents at City Hall had been dismantled in accordance with city policy. Those arrested in last night`s raid were protestors who had returned to the site. According to several media reports the eviction at City Hall was a peaceful one. Reportedly Los Angeles Mayor Antonio Villaraigosa wanted to avoid the confrontations between police and protestors that had mirred other Ocuupy evictions across the United States. According to reports the police and protestors engaged in a peaceful standoff. Protestors sat with arms linked in front of their encampement preferring to be arrested than to leave. Police then removed protestors one by one from their tents arresting them peacefully. The Los Angeles Times is reporting that some protestors believed that police used excessive force in dismanteling the camp. According to Ruth Fowler an Occupy protestor and blogger, police beat two protestors who were running away from the conflict. The same report shows this video of Tyson Heder, described as a non-protestor, being forced to the ground by police after resisting arrest.